Armed with the pride borne of her successes on eleven previous war patrols, GUDGEON, under LCDR Robert A. Bonin, sailed from Pearl Harbor on 4 April 1944 to conduct her twelfth patrol in an open sea area in the northern Marianas. She left Johnston Island on 7 April 1944, after having topped off with fuel, and was never heard from again. Originally scheduled to leave her area on 16 May, she was ordered on 11 May to depart her area in time to take station for a special assignment. An acknowledgement for this message was required and when none was received, it was asked for again on 12 May. On 14 May, her special assignment was given to another submarine, and GUDGEON was told to return to Midway. She should have arrived at Midway about 23 May but failed to do so and on 7 June she was reported as presumed lost. 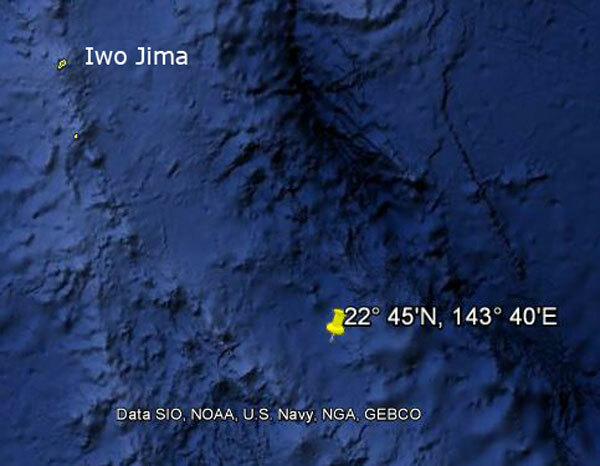 GUDGEON's area was the space from 17° N to 21° N, and 143° E to 147° E but if she arrived earlier than 22 April 1944, she was to patrol the rectangle from 21° N to 24° N, 143° E, to 147° E until that time. Using normal cruising speed, she would have arrived in the area assigned about 16 April. Assuming that nothing irregular happened enroute, she might be expected to have been in the northern area from 16-22 April. On 18 April, enemy planes claimed that they dropped bombs on a submarine. "The first bomb hit a bow, the second bomb direct on bridge. The center of the submarine burst open and oil pillars rose." The position given for this attack is 166 miles bearing 13 degrees T [Editor's note: This is more likely to have been 130 degrees T] from "Yuoh" Island. No island approaching the spelling or sound of this word can be found in the Pacific, and it is assumed that a mistake has been made either by the Japanese or in translation of the position. [Editor's note: In all probability, this refers to 硫黄島 (Iō-tō), commonly known to English speakers as Iwo Jima.] If the island referred to could be Maug, the position given would be in the middle of the area in which GUDGEON should have been at the time specified. The attack described cannot be correlated with any known attack on a U. S. submarine near this time, but it is felt that the possible errors in assuming that this attack sank GUDGEON are too great to list as anything but a possibility. On 12 May 1944, a number of submarines patroling the Marianas reported that the enemy engaged in intensive anti-submarine tactics at about 15° 15' N, 145° 30' E. Early in the afternoon, SANDLANCE states, "while patrolling off Saipan looking for convoy, we heard about forty depth charges eight to ten miles away." Later SANDLANCE received three bombs and twenty-one depth charges herself. SILVERSIDES heard both the first attack and the attack made on SANDLANCE. TUNNY heard depth charging during the afternoon. No submarine returning from the area reported having been attacked on 12 May except SANDLANCE. Japanese data for the attack gives little information save that it was made by planes in cooperation with ships. With so many submarines in the vicinity, and the enemy conscious of their presence, as they undoubtedly were, the attack which was not on SANDLANCE might easily have been on a false contact. The probability as to the cause for GUDGEON's loss is that she was depth-charged, bombed, or both. The attack of 12 May occurred slightly south of GUDGEON's area, but it was not unusual for submarines to leave their areas temporarily for tactical reasons. Since the anti-submarine measures in the Marianas were so intense, it is not unlikely that GUDGEON would be unable to transmit a receipt for the message of 10 May for several days. All of these conclusions are presumptive, and there is a great likelihood that GUDGEON was lost during an unrecorded enemy attack. During her first eleven patrols, GUDGEON was a most active submarine. She sank 25 ships, for 166,400 tons, and damaged 8 more, for 41,900 tons. She started for the Empire but four days after the attack at Pearl Harbor, and there sank a freighter and a submarine. 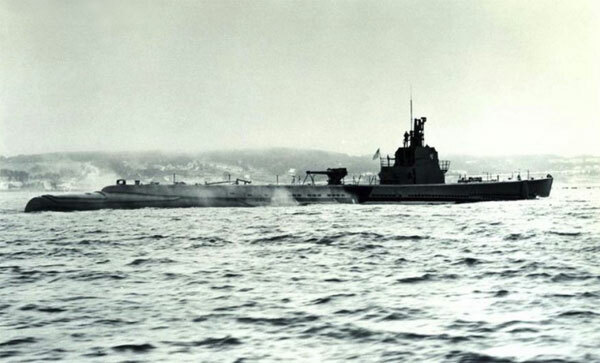 By sinking the Japanese submarine I-73 [Editor's note: corrected from I-173] on 27 January 1942, GUDGEON became the first United States submarine in history to sink an enemy combatant ship. She patrolled the South China Sea in her second war run and sank a large freighter-transport and a medium freighter. Her third patrol was as a member of the forces fighting the Battle of Midway. She inflicted no damage in the battle. Passing from Pearl Harbor to Fremantle, Western Australia for her fourth patrol, GUDGEON patrolled the Truk area enroute. Here she sank three freighters and a freighter-transport, all of fairly large size. Her fifth patrol was in the Bismarck Archipelago, and resulted in the sinking of three freighters and damage to another. GUDGEON patrolled Davao Gulf, Ambon Island and Timor Island on her sixth patrol. She made no attacks on this patrol, but did reconnoiter the latter two islands. In the Java Sea and Strait of Makassar on her seventh patrol, GUDGEON sank two tankers and two freighters and damaged a third freighter. Her eighth patrol covered a passage from Fremantle to Pearl Harbor with principal patrol in the Philippine areas. She sank the largest (17,500 ton) transport ship the Japanese had, a small freighter-transport, a trawler, and damaged a freighter. GUDGEON patrolled Saipan and Rota on her ninth run, and sank a freighter and damaged another freighter and patrol craft. The East China Sea north of Formosa was GUDGEON's area during her tenth war patrol. She sank a large transport, a small freighter, and the coastal defense vessel WAKAMIYA on 23 November 1943. She also damaged a large tanker. In the same area for her eleventh patrol, this vessel sank a large transport and a sampan, and damaged a second sampan. GUDGEON was awarded the Presidential Unit Citation for the period covering her first eight patrols. See also Ed Howard's Final Patrol page on USS Gudgeon (external link).